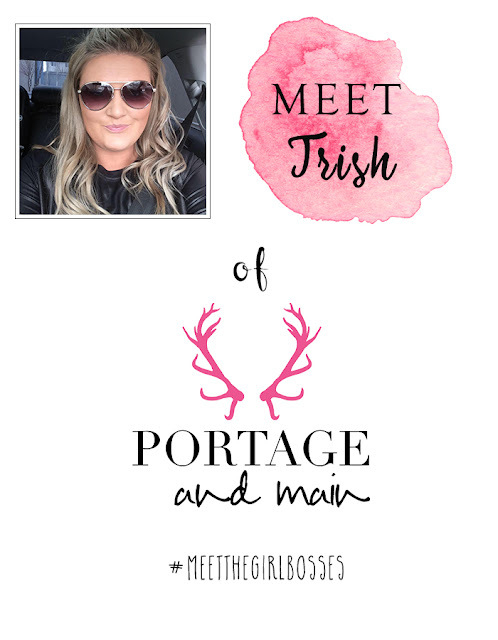 Meet Trish, Girboss of the week! Trish has an amazing brand called Portage and Main where she carries the cutest clothes, accessories and decor for children, fur babies and their mamas. She is from Edmonton (and just launched the very cool YEG collection!). Check out her story below, it is real, authentic and inspiring. Could you describe your business for us? We design and manufacture children clothing here in Canada. Portage and Main is a lifestyle brand targeted towards the modern family that wants to be dressed comfortable and on trend. In addition to selling through our own website (shopPortageandMain.com) and Etsy (portageandmain.etsy.com), we also have several retail stores carrying our line around the world. When did you launch your brand? I started my company in 2013 when my daughter was 6 months old. I was looking for a creative outlet and a way to pass the time at home with a sleepy baby. The company was originally called Crowns and Coroknits and was mostly crocheted goods. in Fall 2014 I shifted my focus to sewing fabric goods and in Fall 2015 I changed the name to Portage and Main. How did you decide to start? Were you inspired by one of your products specifically or did you want to start a business first and thought of the product second? Is it a full time job for you? Originally I just wanted to learn how to crochet. I taught myself very quickly and started selling online to family and friends. When I began to sew and design shirts is when I really saw the potential to scale the business. The business has always been very product driven. There are people that want to own a business and others that want to be "business owners". I am definitely the former. In January this year I put my two kids in full time day care essentially hiring myself full time and now I have three employees that also work with me. It wasn't hard to get things started. I think it depends on how fast you want to scale things. If you want to scale things quickly it can be a lot riskier financially and stressful with growing pains. I have been growing my business very organically and trying to adapt to the market quickly and seamlessly. To be honest, I didn't receive a lot of support from my family and friends (especially so from my spouse). I am always sharing things about my business on my Facebook page and it amazes me how little most of my close friends and family know about what I do. It's a hard realization sometimes that your biggest fans and supporters are complete strangers. Since starting my business I have unfollowed any and all "similar" businesses. I definitely try to support small businesses, local especially, but it is easy to fall into the comparison game and compare your chapter 1 to someone else's chapter 12. What are your hopes for 2016-2017? My goal for 2016 was to open a workshop/ retail location. With the current state of the economy I am not sure if that will be a viable business model. I have really been focusing on expanding my wholesale operations and mitigating some risk by selling in various countries. I would love to double my current number of retailers by the end of the year. Sticktoitiveness is important but so is loving what you do. If you don't feel connected with your business or don't find joy in what you do don't be afraid to change things up or hire someone to take on tasks you don't love to do. Check out Trish's brand online by clicking here. How cute are those striped and Batman harem pants? Until the end of June, enjoy free international shipping with code ORANE!